You can add cooked chicken or shrimp if you would like. Boil pasta noodles, set aside, reserving about 1/4 to 1/2 cup pasta water. Lightly grease a 9 x 13 dish. Pour 1/4 cup of pasta sauce into bottom and spread a layer of sauce across bottom. Sautee garlic, onion and spinach in 1 Tablespoon olive oil. Season with black pepper, then set aside on paper towels to drain. 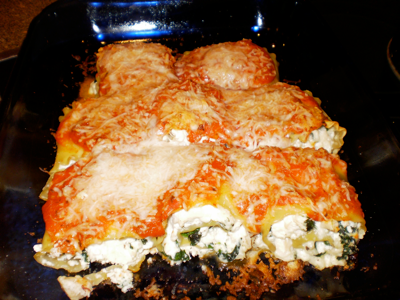 In a large bowl, combine spinach, ricotta cheese, garlic, egg, black pepper and basil. If using cayenne, add cayenne and nutmeg, combine well. (If using cooked chicken or cooked shrimp, cooked meat, etc., add now and stir well). Stir in 1 cup of shredded cheese and parmesan cheese. Spread mixture (about 2 Tablespoons filling) across noodles and roll, then place into prepared dish, seam side down. Pour remaining sauce on top, then add remaining 1 cup cheese. Bake at 350 for 45 to 50 minutes.